Please enjoy this excerpt from “The Rules of Creation” by Lynda Allen. 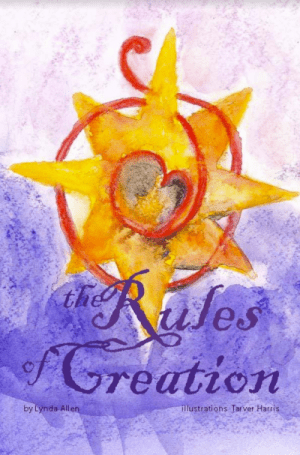 “The Rules of Creation” have been waiting to be born for nine years. They began as a simple, one-page treatise on how to joyfully create with the mysterious energy of life that I would call Spirit. This is a handbook for living life from the pure essence of divinity from which we each sprang. The rules not only share wisdom, but encourage each of us to explore the depths of our own innate wisdom as well. It offers eight simple rules to live by which help us not only remember our own divinity, but to live from there with joy and certainty. It offers an opportunity to journey to a place where we are greeting every day with the joy of knowing that each moment we can choose to give back to the universe the pure essence of Spirit that was gifted to us. The transformation to this way of living will not always be simple or easy, but the goal of the transformation is a life lived from love and the soul’s joy and so is well worth the journey. The rules are each accompanied by a meditation and/or exercise to help deepen the knowing and practice of each rule. The meditations and exercises are intended to be practices to be worked with again and again, reaching new depths of insight with each practice. Each rule is also accompanied by a mandala specific to that rule. The reader is encouraged to work with each mandala repeatedly, seeing new images and building on their insights each time. This is the most important rule; all the others are insignificant if you don’t know this rule. You create your life. You create your world. You came here as a creator and you have been creating your life since the day you were born. There Your life is a gift of creation. When you enter this life you enter it with is absolute freedom in the knowing that you are a creator, all the power of creation within you. You are born as an acorn, with that you are connected in each moment with God and unending all that you need to become a beautiful expression of yourself found love and wisdom. within. You are born knowing your connection to Spirit, knowing that there is no separation, only oneness. You still know all this, you still have within you all that you need to create the life of your most beautiful and loving expression. Sit with that for a moment. You are connected in each moment with God and unending love and wisdom. You must first leave behind your ideas of creation. You are breaking no rules, you are not self aggrandizing. on the contrary, you are honoring. There is nothing you can’t know or do or imagine a simple truth about yourself. You are a creator. Say it, “I am a creator. and so make real. You are a creator and you I create my life.” can create from unending love and wisdom. Imagine a world where we all create that way. How beautiful! You may ask but what about the dire circumstances I find myself in? Did I create that? I would only ask you to look at the lives of others who have been in dire circumstances and who have remembered that truth within themselves. No matter your circumstances you can create anew in any moment. The key for pure creation is where you create from. A life created from fear and from the mind will look one way. A life created from the heart and the wisdom within it will look another way. You have the power to create either way. Your life is yours to live and to create. Some as they are remembering that they create their life, feel it as a great responsibility and feel guilt for what they have created so far. But you can see it differently. It is not a responsibility but rather a gift. God and unending love and wisdom. Our work with the first Rule begins simply, with only a meditation. Our goal is to relax into these two knowings from Rule 1: you are connected in each moment with God and you are connected in each moment with unending love and wisdom. MEDITATION: To begin your meditation move to a place you find comfortable for going into the stillness, whether that is indoors or outdoors. Enter into whatever meditation practice you use and settle into the stillness, the deep stillness of the void from which All originates. Take your time getting there; allow your body to be physically comfortable. Acknowledge whatever thoughts arise and allow them to drift away like clouds on a gentle breeze. Breathe deeply until you can feel your whole body is still and at peace. You are connected in each moment with God. Breathe deeply into your heart and allow it to expand enough to hold that thought. You are connected right now with God. Even as you are reading these words and feeling their meaning, you are experiencing them with the presence of God. God is present with you in this moment. You are breathing in this knowing with God and that presence of God enables you to open your heart wide enough to hold and know that presence within your human expression. Be still until you feel comfortable with that presence with and within you. This may take time; seconds, minutes, days, years, it doesn’t matter how long. You were born knowing the presence of God within you, that knowing still remains, but you must allow time for the reconnection with that knowing. It is important to take this time to anchor in that knowing, that memory of your oneness with God. Once that knowing is anchored in it will serve as a pathway back to that connection in times of forgetting. Enjoy as much time in the stillness as you need in order to be reunited with the presence of God. You are connected in each moment with unending love and wisdom. Continue to breathe deeply into your heart and still your mind. From within you radiates unending love and wisdom. There is nothing that can stop the flow of that love and wisdom except your own thoughts. Be still and allow any of those limiting thoughts that would contradict this statement to arise. When they do arise, acknowledge them, understand that they no longer hold any power over you, bless them for the lessons they provided and release them with love. Repeat this process for any doubting and limiting thoughts that arise. Remember that you have the inexhaustible love and wisdom to release them and move on without them. Once your thoughts have become still allow that love to flow forth from you. Smile at the knowing that you are a source of love in the world right now. You are a source of love in the world right now. Let love overflow from your being and move gently out into the world, knowing that as it flows it has the potential to touch each heart on the planet with love. Really imagine that, each heart on the planet being touched by love that flows freely and endlessly from God through you. Sit with that feeling. Now connect with the deep well of wisdom that lies within you. Let go of any preconceived ideas you have about wisdom. It does not depend only upon the education you have received. True wisdom comes from the heart. This unending wisdom that you are connected to is intertwined with the love now flowing from you. Love knows a deeper wisdom than just what is learned in books. Imagine a world where you and all others make daily choices from that kind of wisdom, a wisdom based in love. What a glorious world we can create together with the presence of God and limitless love and wisdom. When you feel your time in the stillness of meditation is complete, return your attention gently to your surroundings.